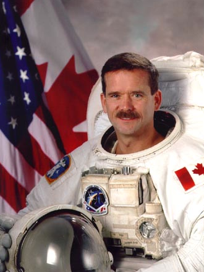 Colonel Chris Hadfield was born in Sarnia, and raised in Milton, Ontario. Chris has been a farmer, a ski instructor, student, an engineer, fighter pilot, test pilot, and for the last 11 years, an astronaut at NASA and the Canadian Space Agency. He enjoys skiing, guitar, singing, riding, writing, running, volleyball and squash. He is also a member of the Astronaut Rock-N-Roll Band MAX Q in which he sings and plays the bass and guitar. His brothers and sisters in Canada are all musicians. In June 1992 Chris Hadfield was selected to become one of four new Canadian astronauts from a field of 5330 applicants. He was assigned by the Canadian Space Agency (CSA) to the NASA Johnson Space Center in Houston, Texas in August of the same year, where he addressed technical and safety issues for Shuttle Operations Development, contributed to the development of the glass shuttle cockpit, and supported shuttle launches at the Kennedy Space Center, in Florida. In addition, Hadfield was NASA’s Chief CapCom, the voice of mission control to astronauts in orbit, for 25 space shuttle missions. From 1996 to 2000, he represented CSA astronauts and coordinated their activities as the Chief Astronaut for the CSA. From 2001-2003, Hadfield was the Director of Operations for NASA at the Yuri Gagarin Cosmonaut Training Centre (GCTC) in Star City, Russia. His work included coordination and direction of all International Space Station crew activities in Russia, oversight of training and crew support staff, as well as policy negotiation with the Russian Space Program and other International Partners. He also trained and became fully qualified to be a flight engineer cosmonaut in the Soyuz TMA spacecraft, and to perform spacewalks in the Russian Orlan spacesuit. Hadfield is a civilian CSA astronaut, having retired as a Colonel from the Canadian Air Force in 2003 after 25 years of military service. He was Chief of Robotics for the NASA Astronaut Office at the Johnson Space Center in Houston, Texas from 2003-2006, and was Chief of International Space Station Operations there from 2006-2008. Space flights: In November 1995 Hadfield served as Mission Specialist 1 on STS-74, NASA’s second space shuttle mission to rendezvous and dock with the Russian Space Station Mir. During the flight, the crew of Space Shuttle Atlantis attached a five-tonne docking module to Mir and transferred over 1,000 kg of food, water, and scientific supplies to the cosmonauts. Hadfield flew as the first Canadian mission specialist, the first Canadian to operate the Canadarm in orbit, and the only Canadian to ever board Mir. In April 2001 Hadfield served as Mission Specialist 1 on STS-100 International Space Station (ISS) assembly Flight 6A. The crew of Space Shuttle Endeavour delivered and installed Canadarm2, the new Canadian-built robotic arm, as well as the Italian-made resupply module Raffaello. During the 11-day flight, Hadfield performed two spacewalks, which made him the first Canadian to ever leave a spacecraft and float freely in space. In total, Hadfield spent 14 hours, 54 minutes outside, travelling 10 times around the world. From 2008-09, Hadfield served as the backup for Dr. Bob Thirsk for Expedition 20/21, a long-duration spaceflight, training to live and work on board the ISS for a period up to six months. After this assignment, he supported the ISS Operations Branch and developed Emergency procedures for the ISS. From May 10 to 23, 2010 Hadfield was the Commander of NEEMO 14, a NASA undersea mission to test exploration concepts living in an underwater facility off the Florida coast. NEEMO 14 used the ocean floor to simulate exploration missions to the surface of asteroids, moons and Mars in order to gain a better understanding of how astronaut crews interact with equipment including advanced spacesuits, a lander, a rover and robotic arms. In June 2010, Hadfield was part of the Pavilion Lake research team, located 420 km northeast of Vancouver. Pavilion Lake is one of the few places on Earth where microbialites are found. The team used a combination of remotely operated vehicles, autonomous underwater vehicles, SCUBA divers and DeepWorker submersibles to help understand how the microbialites formed and possibly make it easier to identify potential forms of extraterrestrial life on future missions to Mars. In September 2010, Chris Hadfield was assigned to Expedition 34/35. On December 19, 2012 he launched aboard the Russian Soyuz, enroute to becoming the second Canadian to take part in a long-duration spaceflight aboard the ISS. On March 13, 2013 he became the first Canadian to command a spaceship as Commander of the ISS during the second portion of his five-month stay in space. On May 13, Hadfield, Tom Marshburn and Roman Romanenko landed in Kazakhstan after travelling almost 99.8 million kilometres while completing 2,336 orbits of Earth. The trio spent 146 days in space, 144 of which were aboard the station. In June 2013, Chris Hadfield announced that he would retire from the CSA as of July 3, 2013 to take up new challenges. Follow Chris on Twitter (@Cmdr_Hadfield)! Chris is also the New York Times Bestselling Author of “An Astronaut’s Guide to Life on Earth”.